To southern Californians, Oak Glen = apples. Make a day of it, bring the family, breathe the crisp mountain air, pick your own apples, eat pie and enjoy the gorgeous scenery in this old-fashioned mountain town. 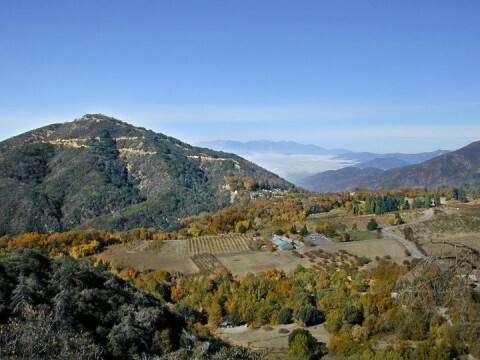 If you live in or are visiting Southern California now, get yourself to Oak Glen, a rustic, scenic agricultural community in Apple Country in the San Bernardino Mountains, about 15 miles east of San Bernardino. It’s a perfect Fall day trip or autumn get-away — family-friendly, old-timey, with places for the kids to run around, gift shops for the adults, and apple-picking and apple-eating as the underpinning of a great day. The crisp mountain air is matched by the crisp apples just waiting to be plucked by flatlanders, who have flocked here since apples became the main crop in the 1940s. Oak Glen Road is a 5-mile loop with more than 30 independently owned ranches, farms and businesses, so there is plenty to explore, but I’ll start you out with the tour we did with a small group of Los Angeles food bloggers. You know we’re going to steer you to some some delicious destinations. 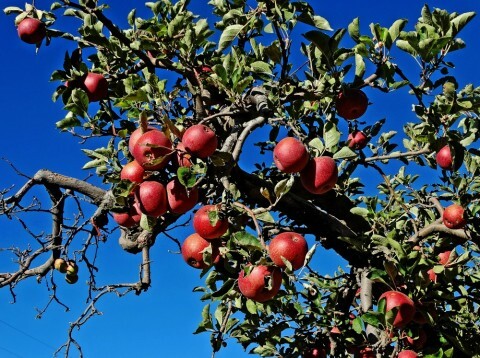 Riley’s at Los Rios Rancho:  This 103-year-old ranch is Southern California’s largest historical apple ranch. 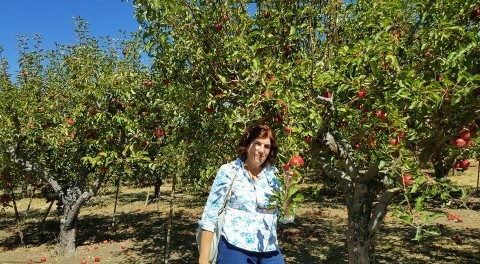 Orchards open, ripe, and ready to pick the weekend we went were Granny Smith, Red Rome and Fuji; as different orchards ripen, they will open to pickers. Grab a bag from the counter, walk to the orchard, stroll among the trees and reach up and pick your favorite fruits. When you’re done, pay by the pound. There’s a country store there, as well as meat roasting on a barbecue outside. Take a rest on their expansive grassy lawn (perfect for a picnic), or head on your way to the next stop. 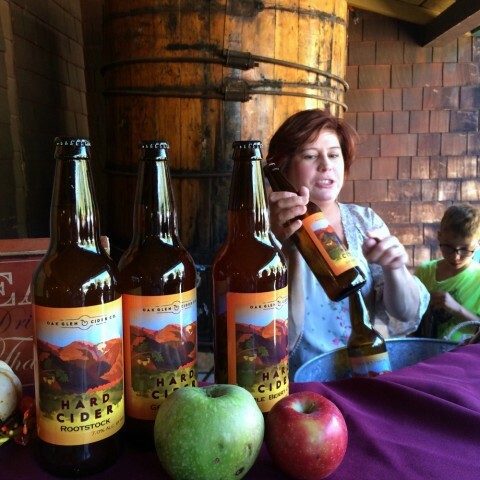 While at Los Rios Rancho, hit the Oak Glen Cider Company  stand outside, where you can taste and buy their artisanal hard cider. It’s “hard” because it is fermented, using only apple cider and yeast, which produces a carbonated beverage that is about 6% alcohol. What does it taste like? Rootstock reminded me of an apple-tinged beer, and Gravenstein Cider and Apple Berry Cider might be more likened to wine (rose? ), although each taster in our group had a different opinion. I imagined myself with a drippy grilled Gruyere cheese sandwich for lunch, accompanied by a chilled glass of their Rootstock Hard Cider, and I got a big smile on my face. They can hardly keep up with demand, and sell out each weekend, so go early. Those three little words…so good, so worth the line you may wait in to get them. Stop at Snowline Orchard and Winery , get in the queue outside, and breathe deeply of the cinnamon-inflected air wafting out from the donuttery. (Is that a word? It should be.) 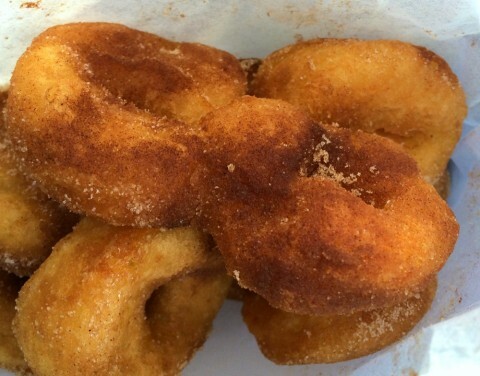 Watch as their machine plops mini donuts into a lake of hot oil, where they swim for a bit, do the backstroke, and emerge, only to be dried off, dusted with cinnamon sugar and slid into a bag for you to munch on, hot, sugary and so deeply satisfying. “These will change your life,” said our blogger guide Sara De Leeuw . I scoffed until I had one in my mouth. Then I just nodded; the universe had opened its secrets to me. 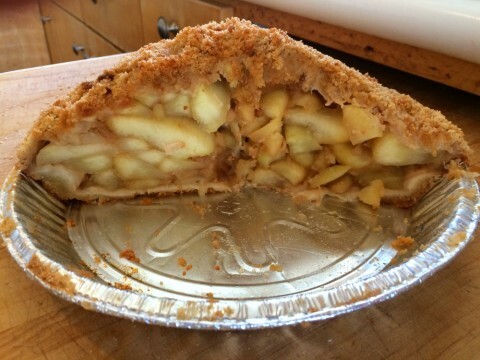 You didn’t expect to leave Oak Glen without a bakery box heavy with a freshly baked apple pie, did you? 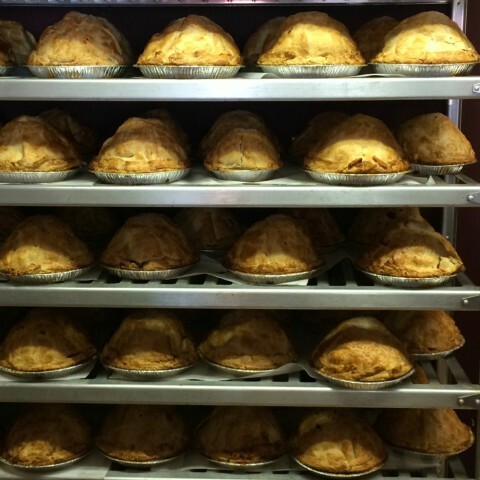 Stop at Apple Annie’s  in Oak Tree Village and rest your gaze on their shelves of tall pies. Eat a mel in the restaurant (chicken pot pie, fried chicken, ribs, fish and chips, apple pie by the slice) if you like, but don’t leave without a whole pie, either with a top crust or streusel. Buy the mini pie if you must, but I’m here to tell you there is no finer breakfast the next morning than a slice of Apple Annie’s Mile-High Apple Pie. Plan accordingly; buy the big 5-pound pie. There’s 14 acres of family fun here, as well, so bring the kids. 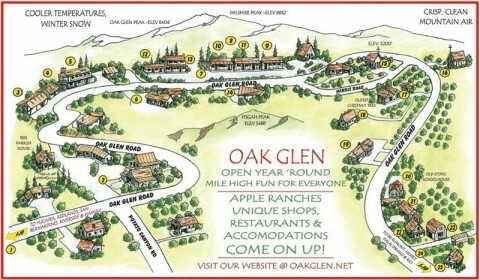 Are you ready to take a trip to Oak Glen? I’d go again in a New York miute! 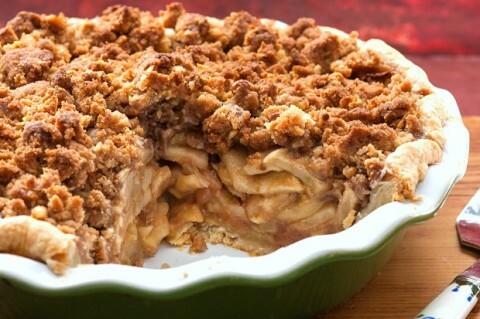 If you want to bake an Apple Pie with Streusel Topping, I have a great recipe here . It’s not quite mile-high, but it’s every bit as delicious and addictive. If you like this article and want to save it, pin the image below to your Pinterest board. This was originally published Oct. 9, 2017 on Shockingly Delicious, and has been republished today.